Knee pain refers to any aching or burning pain in the knee joint. Knee pain can be a symptom of numerous conditions and diseases, including knee stress, osteoarthritis, injury, gout, infection, and bursitis. Knee pain is very common. Each year, millions of Americans visit the doctor for knee pain. It is the most frequent reason for visits to an orthopedist (bone and joint surgeon). To understand the various causes of knee pain, it is important to know how the knee functions. The knee refers to the joint where the femur (thigh bone) meets the tibia (largest lower leg bone). In front of this joint lies the patella (knee cap). The joint is lined by a membrane called a synovial sac. The synovial sac produces synovial fluid which acts as a lubricant much in the way that oil lubricates the moving parts of machinery. Other tissues that make up the knee joint include cartilage, muscles, tendons, and ligaments. The upper end of the tibia has cartilaginous shock absorbers called menisci (singular meniscus). Other protective structures are the bursae, which cushion areas of friction in the joint. Most of the muscles involved with joint mobility originate in the thigh, cross the knee joint, and attach to the tibia. The knee supports two to three times a person’s body weight. It is a complex joint that allows for a considerable range in mobility. In addition to simple flexion (bending) and extension (straightening) movements, the knee joint is designed to allow for rotation, gliding, and rolling movements. To allow for complex mobility and joint stability, joint strength is sacrificed, making the knee vulnerable to injury. Arthritis. Osteoarthritis (joint degeneration), rheumatoid arthritis (joint inflammation), and septic arthritis (joint infection) can cause knee pain. Bursitis. Inflammation of the bursae of the knee can cause knee pain. Bursitis, sometimes called housemaid’s knee, can be caused by infection, gout, rheumatoid arthritis, injury, illness, or chronic irritation (crawling or kneeling). Cysts. A cyst is a fluid-filled sac. Cysts associated with the knee can cause swelling and knee pain or discomfort. Fracture. Breakage or crack in any of the bones associated with the knee joint can cause knee pain. Gout. A faulty chemical process leads to high levels of uric acid in the blood which causes inflammatory arthritis, crystal deposits in joints, joint destruction, and joint pain. Ligament injury or instability. The ligaments supporting the knee may be injured or strained by persons who participate in sports, particularly football, rugby, lacrosse, basketball, skiing, soccer, and volleyball. Other accidents can also cause ligament damage. Loose bodies. This condition refers to any loose objects that float around the knee and cause problems. They also are called “joint mice” because of their elusive nature. Meniscus conditions. Damage, usually in the form of a tear, to the menisci can result from degenerative changes associated with advancing age or sports-related injury. Sports that commonly cause menisci damage include football, basketball, soccer, tennis, lacrosse, and skiing. Osteonecrosis. Degeneration of the bones associated with the knee cause pain and deformity. Patellofemoral pain. Also known as anterior knee pain syndrome, this condition is characterized by pain around the knee cap. The exact cause of patellofemoral pain is unknown but is probably related to muscle inadequacy, lack of flexibility, rapid growth, or bone positioning. Knee pain can be diagnosed and treated by an orthopedic surgeon. Diagnosis is based primarily on medical history and physical exam. 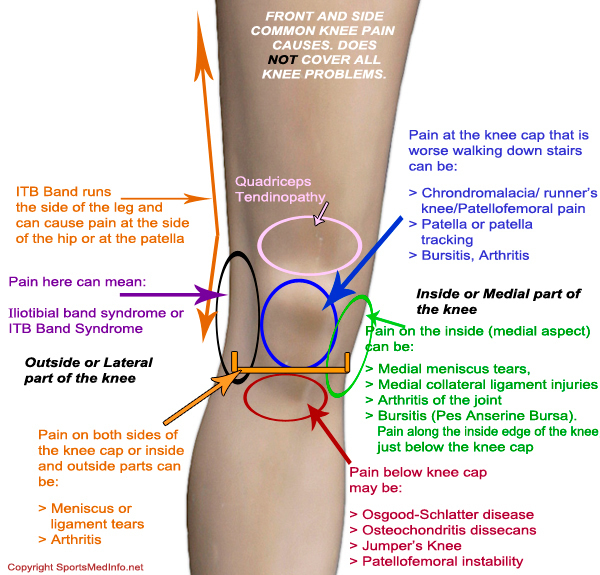 The diagnosis begins with a detailed medical history to fully characterize the knee pain. The knee will be bent to determine the range of motion and palpated (felt with the hands) to detect the presence of any abnormalities. The physical exam may include any of a number of different tests designed to detect injuries by manipulating the knee and leg. X rays may be taken. In some cases more advanced testing may be carried out using magnetic resonance imaging (MRI), computed tomography (CT), or contrast arthrography (x ray following injection of a contrast solution). Most alternative treatments for knee pain aim at reducing pain, inflammation, and stiffness. Persons experiencing long-term or severe knee pain should consult a physician to determine the underlying cause. Several herbal remedies are recommended to relieve knee pain. Some remedies are used externally, while others involve internal use of herbs. Acupressure. Pressing the Stomach 36 point located below the knee caps tones muscles and relieves joint pain anywhere in the body. Pressing the Spleen 9 points located below the kneecap on the inside of each leg relieves knee pain. Acupuncture. Inflammation and pain may be relieved by acupuncture. The large intestine meridian is the most effective channel for pain relief. A National Institutes of Health consensus panel found that acupuncture may be an effective treatment for osteoarthritis pain. Aromatherapy. Aromatherapy with essential oils is sometimes recommended. The essential oil of peppermint relieves pain and decreases inflammation. The essential oil of rosemary relieves pain and relaxes muscles. Chinese medicine. Knee sprain and contusion (bruise) are treated by application of Shang Ke Xiao Yan Gao (Relieve Inflammation Paste of Traumatology) and ingestion of Die Da Wan (Contusion Pill). Once the initial pain and swelling have been reduced, the patient can apply Shang Shi Zhi Tong Gao (Relieve Damp-Inducing Pain Medicinal Plaster). Exercise. Regular moderate exercise can reduce pain by improving the strength, tone, and flexibility of muscles. The endorphins released while exercising may also be helpful. Food therapy. Following a detoxification diet may restore nutritional balance to the body and relieve joint pain. Animal proteins may induce joint pain caused by such inflammatory conditions as arthritis, so following a vegetarian diet may be helpful. Homeopathy. Rhus toxicodendron is recommended for joint and arthritis pain that is worse in the morning and relieved by warmth. Kali bichromium is indicated for persistent, severe pain. Other homeopathic remedies can be designed for specific cases by a homeopathic practitioner. Hydrotherapy. A warm compress can relieve joint stiffness and dull pain. A cold compress or ice pack can relieve sharp, intense pain. Magnetic therapy. Magnetic fields may increase blood flow and block pain signals. Massage. Joint pain may be relieved by massaging the area above and below the painful joint. Massaging with ice packs may interfere with pain signals and replace them with temperature signals. Reflexology. Knee pain may be relieved by working the knee reflex points. Rolfing. This deep, sometimes painful, massage therapy may speed healing and reduce pain. Supplements. Knee pain may be relieved by taking vitamin C to promote healing, the B vitamins to balance the nervous system, which reduces pain, and calcium to increase bone strength. Knee pain may be relieved by taking such nonsteroidal anti-inflammatory drugs as acetaminophen (Tylenol), ibuprofen (Advil, Motrin), or naproxen (Aleve). More severe pain may be treated with such prescription pain relievers as tramadol or a narcotic. Additional treatment for knee pain depends upon the underlying cause and may include injection of drugs into the knee, surgery, wearing a brace, and/or physical therapy. Surgical treatment depends on the cause; but in the case of osteoarthritis, some patients face actual replacement of the joint. However, in 2002, a new device was introduced that postponed the need to replace an arthritic knee. The device is made of chrome and fits between the natural structures of the knee. Most causes of knee pain respond well to conservative treatments and resolve within 4–6 weeks. Knee pain caused by injury or disease may require surgery and lengthy rehabilitation. Strengthening the leg muscles may help prevent knee pain caused by overworking the joint. In addition, a stronger knee may prevent injury to the joint. Squats are an easy exercise that will strengthen the quadriceps (front thigh muscles) and hamstrings (back thigh muscles). The yoga warrior posture strengthens the muscles around the knee and increases range of motion.